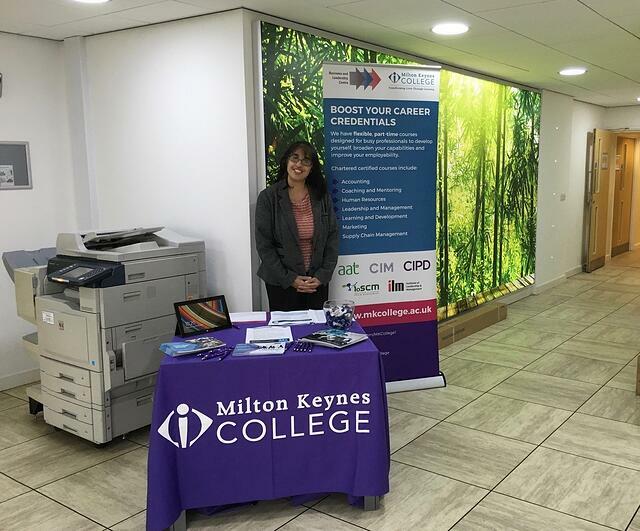 Milton Keynes College visited our iCentre at Newport Pagnell this week to promote various professional courses which are on offer at MK College. Bucks Biz were proud to assist the college and encourage people to sign up to their professional courses. At the ongoing #PQRoadshow2015, the college are offering a range of professional courses including accounting, coaching and mentoring, human resources, IT skills, leadership and management, marketing and supply chain management. The roadshow is a great opportunity to boost your career credentials; improve your knowledge, advance your career and invest in yourself. The college's friendly staff including Renu (pictured above) will be on hand to offer advice and guidance to make sure you get on the course which is right for you. Interested in advancing your career with a Leadership and Management (ILM) qualification? Click on the link to take a look at our two-day courses based in London. Interested in the roadshow coming to your business place?Contact business.centre@mkcollege.ac.uk or call 01908 684520. Helping the community is always a great passion of Bucks Biz's and we encourage everyone thinking about their career to come and say hello to MK College at the locations above. Helping businesses is also a great passion of ours; Bucks Biz will be very happy to help if you are looking to rent office space in Milton Keynes, we also rent out industrial space in MK - simply get in touch with our sales team on 01908 821000. We are open to all enquiries and offer bespoke commercial properties. Feel free to click the link below and browse our current deals.